Several times this week, I missed the UPS driver who was trying to deliver some wine to my house. He or she tried three times, but never at the same time of day, to deliver the box. Someone 21 or older needed to be home to sign for the delivery, but the sticky note left on our door never gave me a sense of when the driver would return. Three days in a row, I second-guessed wrongly. On Thursday, the note left behind warned there would be no more attempts. So I called UPS and found out I had five days to hoof it to the customer center in Kansas City’s West Bottoms to pick up my parcel. Mama needs her wine, so I went on Friday. Which is what brings me to my post today. I presented myself and my government-issued ID and asked for my box o’ wine, please. There were two middle-aged (and by that, I mean my age) white dudes working the counter. One pleasantly told me he’d go find my box. The other gave me the once over and left the room, too. But I could hear him in the next room, talking to a third person whom I never saw. These guys proceeded to make small talk, which revolved around a woman pulling a gun on a man in a Wal-Mart parking lot. Then one guy started talking about his own concealed-carry class, telling a story about a woman who was in the class with him. He launched into a narrative about the “black lady” and mimicked her accent while the other guy laughed. I couldn’t quite get the point amid all the laughter. And those, my friends, are examples of microaggressions. 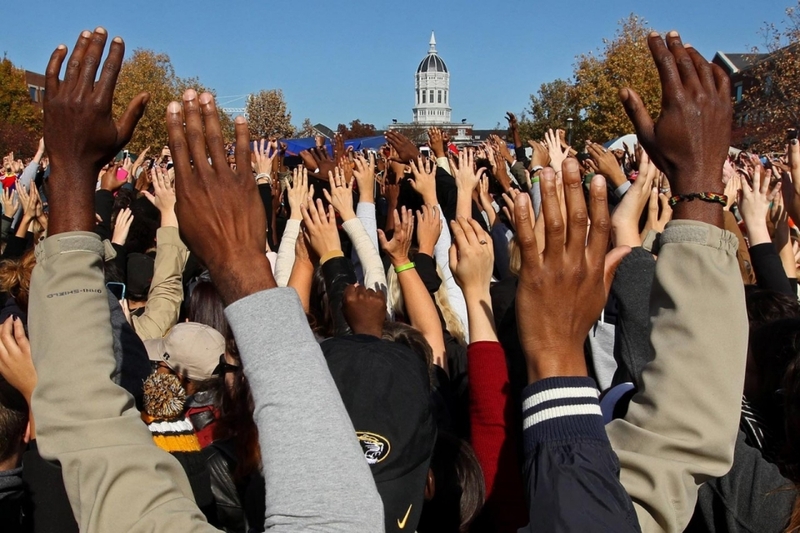 Much has been said about microaggressions in light of the recent protests at the University of Missouri and elsewhere regarding how minorities are treated. Sure, as a society we’ve come a long way since 1950, the year black students first gained entry at MU. By and large, we don’t have lunch counters that won’t serve minorities or separate drinking fountains. On paper, we have integration everywhere from schools to churches to neighborhoods. But the reality is that it’s the everyday, casual racism that’s gnawing away at the progress our parents and grandparents made and that threatens to create massive unrest across our nation. I was so shocked at the question that I couldn’t come up with a snarky comeback. Who the hell cares? And why would that ever be any of that guy’s business? Those are egregious and pretty obvious. My friends of color encounter many more subtle microaggressions, such as being referred to as “articulate” when he or she is able to succinctly and intelligently express himself or herself. Or someone expressing surprise when he or she finds out a person of color’s parents went to college. Or are married. In her excellent essay about her days at MU, Mashable.com political editor Juana Summers describes her attempt to gain entry into a white social sorority. She matriculated at Mizzou 20 years after I did, yet that bastion of college life still had not opened its doors to people who looked like her. She was made to feel that she was the wrong person in the wrong place. If you’re a member of a marginalized group, you learn you can’t become angry at every slight. To do so would drive you completely nuts. You’d become paranoid. So you brush them off, you work harder, you tell yourself you don’t care what others think because you are better than they are. But every little microaggression hurts, like a tiny drop of acid rain on the hood of a shiny new car. After years and years of rain, the finish gets worn. You get tired. And you don’t want your kids to have to go through the same things you have. That’s what students are protesting about at the University of Missouri and Yale University and Claremont-McKenna College and Southeast Missouri State University and colleges everywhere. Click here for a two-page guide to recognizing microaggressions.